Events that took place on this hill almost 130 years ago have inspired many a poems, the best and most moving one being Ivan Vazov's classic "Epic of the Forgotten". Today, it is still one of the main symbols of Bulgaria's fight for liberation and hundreds will gather there on March 3, to bow their heads in memory of those who fought for the country's freedom. 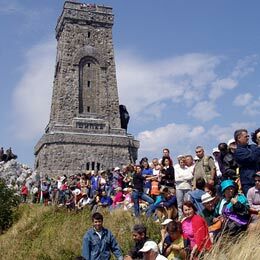 The mount of Shipka has always evoked feelings of pride among Bulgarians, although lately it became a cause of shame, when it was twice desecrated and robbed by people who wanted to sell its copper ornaments for scrap. Once a year, on March 3, everyone remembers the monument and some even climb the 894 stairs that lead to the historical peak. People often say that those who haven't climbed these stairs at least once are not truly Bulgarians at heart. The fierce battle that took place at the mount of Shipka took the lives of hundreds and, as the poem goes, the desperate Bulgarians, were besieged at the peak for three whole days as the Turks were closing in on them. They ran out of ammunition and after they had thrown every rock in sight at the attacking hordes, the rebels took a desperate move - they started throwing the dead bodies of their friends. This shocked the Turks and the Bulgarians managed to hold off the peak until their allies came. This victory later inspired people to donate the money for building the 31.5-meter-high monument. It was designed by architect Atanas Donkov and sculptor Alexander Andreev. Its official unveiling in 1934 gathered thousands. A bronze lion keeps guard of the entrance to the monument along with a statue of a woman who symbolizes the victory over the Ottoman troops. Inside the truncated pyramid, a huge marble sarcophagus still keeps the remains of some of the heroes in the Shipka epic. Four more stories above are filled with battle flags and other relics. The marvelous view from the top of the tower alone is worth taking a hike up all the stairs.